The American Society of Civil Engineers has named Joannes J. Westerink the inaugural recipient of the Orville T. Magoon Sustainable Coasts Award. 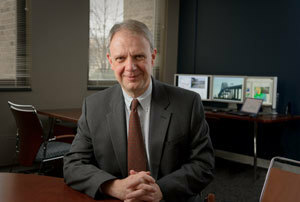 Westerink is the Joseph and Nona Ahearn Professor in Computational Science and Engineering and Henry J. Massman Chairman of the Department of Civil and Environmental Engineering and Earth Sciences at the University of Notre Dame. The award will be presented at the 34th International Conference on Coastal Engineering in Seoul, South Korea, in June. Established by the ASCE in 2013, the Magoon Award recognizes outstanding contributions to sustainable engineering practices in managing shorelines and coastal infrastructure through research, design, construction or management of both natural and built environment in coastal zones. It is named for Magoon, a coastal engineer who served the United States Army Corps of Engineers from 1952 to 1985 and was an early leader in sustainability. Focusing on the development, analysis and application of coastal ocean hydrodynamic and transport codes and models, Westerink has pioneered the successful development of unstructured mesh coastal ocean models that integrate a wide range of scales — from ocean basins, continental shelves, coastal flood plains, estuaries and rivers to channels, and integrating a wide range of processes such as tides, winds and waves. Application areas include the western North Atlantic Ocean; the Gulf of Mexico; the Caribbean Sea; the Pacific Ocean; the South China Sea and the Indian Ocean; the coasts of Texas, Louisiana, Mississippi, New York, Massachusetts, Oregon, Washington and Alaska; and the Hawaiian Islands, Puerto Rico, the Bahamas and the U.S. Virgin Islands. In particular, his work is focused on the physics of tides and hurricane waves and surge in coastal regions. He is the co-developer, with Rick Luettich of the University of North Carolina at Chapel Hill and Clint Dawson of the University of Texas at Austin, of the widely used ADCIRC finite element-based shallow water equation code. ADCIRC is a robust analysis tool that has evolved into a community-based coastal hydrodynamics code with wide-ranging applications within academia, government and the private sector. The U.S. Army extensively uses the ADCIRC model worldwide to assess coastal currents and water surface elevations. It was used to design the $15 billion hurricane flood risk mitigation system recently completed in Southern Louisiana by the U.S. Army Corps of Engineers. In addition, the Federal Emergency Management Agency applies ADCIRC to evaluate hurricane flood risk along the U.S. East and Gulf coasts, and the National Oceanic and Atmospheric Administration uses ADCIRC in support of forecasting tides, as well as extra-tropical and tropical storms for U.S. coasts and estuaries. Industrial applications of ADCIRC range from U.S. nuclear power station flood risk assessment required by the U.S. Nuclear Regulatory Agency to tidal power station design in Korea. Westerink has received numerous awards throughout his career, including the BP Outstanding Teacher of the Year Award in the College of Engineering at Notre Dame in 2004, Outstanding Civilian Service Medal from the Department of the Army in 2007, the U.S. Army Corps of Engineers Interagency Performance Evaluation Task Force Leadership Award in 2007, and the Rev. Edmund P. Joyce, C.S.C., Award for Excellence in Undergraduate Teaching at Notre Dame in 2010. Westerink, who joined the Notre Dame faculty in 1990, is a member of the American Geophysical Union, American Meteorological Society and ASCE. He obtained his B.S. and M.S. degrees in civil engineering at the State University of New York at Buffalo and Ph.D. degree, also in civil engineering, from the Massachusetts Institute of Technology. Originally published by Nina Welding at news.nd.edu on February 20, 2014.